We are in San Diego, California this afternoon for a conversation with Warren Buffett. He is a man congressional leaders, the administration, and the Federal Reserve want to talk and talk to. He is the legendary chairman and CEO of Berkshire Hathaway. Its success has made him the world’s richest man. He’s admired for his investment results over a long period of time. He is trusted for his common sense and the fact that he’s warned over the years, in his annual letter to stockholders, about some of the things that are contributing to the crisis facing America and the global economy. For all those reasons, we have come to see him in San Diego where he is attending the Fortune Magazine’s most powerful women’s summit. Later, he will be interviewed at a conference by the Fortune reporter and long time friend, Carol Loomis. We come this evening from the studios of our public television affiliate in San Diego, KPBS. I thank my friend, Warren Buffett, for taking time in a busy schedule to talk to us. Well, I got a call this morning from a friend of mine at Goldman Sachs saying they might be interested in such an investment. I’m familiar with the company. I’ve known the management, the current management, Jack Welch before Jeff Immelt. I’ve known him for decades. And so I understand their businesses. We do lot of business with him, and GE has been — I think it’s the longest running stock in the Dow Jones industrial average. It will be 100 years now it will be around. I hope I’m around then, too. And it was an attractive investment. And we have had a lot of money around, over the last two years, and we’re seeing things that are attractive now. Are you looking at other things? I look at everything, Charlie. That’s my job. I really do. I mean every day, I think about everything, yeah. I know, but cash is said to be king now. 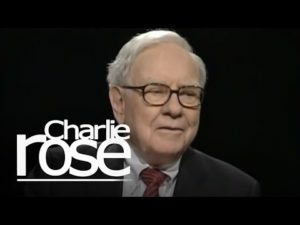 Are you sitting on a lot of cash so that this is the time for Berkshire Hathaway and Warren Buffet to look carefully at a lot of opportunities. Yeah, we want to use cash. The reason we haven’t used our cash two years ago, we just didn’t find things that were that attractive. But when people talk about cash being king, it’s not king if it just sits there and never does anything. There are times when cash buys more than other times, and this is one of the other times when it buys a fair amount more, so we use it. There is a time to accumulate and a time to spend. Absolutely. You want to be greedy when others are fearful. You want to be fearful when others are greedy. It’s that simple. They’re pretty fearful. In fact, in my adult lifetime, I don’t think I’ve ever seen people as fearful economically as they are right now. Well, it’s because they — they have seen the credit market seize up. They’re worried about money market funds, although the latest proposition from government should take care of that. They’ve seen eight percent of the bank deposits in the United States get moved very skillfully, I might say, within the last couple of weeks from institutions that they thought were fine a few months ago to other institutions. They are not wrong to be worried. Is it being felt as people often point out on Main Street? Well, I’ve read about all the sales today. If you’re an auto dealer, you’re feeling it. If you’re a furniture retailer like we are, you’re feeling it. If you’re a jewelry retailer, you’re feeling it. I know some of these businesses because we’re in them. Yeah, it’s being felt, but it will be felt big time more if we don’t do something about it, what’s going on. The Senate will vote sometime this evening. Are you satisfied with that rescue plan? Well, I don’t think it’s perfect, but I don’t know that I could draw one that’s perfect. But I’d rather by approximately right than precisely wrong, and it would be precisely wrong to turn it down. We need — we have a terrific economy — it’s like a great athlete that’s had a cardiac arrest. It’s flat on the floor, and the paramedics have arrived. And they shouldn’t argue about whether they put the resuscitation equipment a quarter of an inch this way or a quarter of an inch this way, or they shouldn’t start criticizing the patient, because he didn’t have a blood pressure test or something like that. They should do what’s needed right now. And I think they will. I think the Congress will do the right thing. I think that they’ve — you know, they got into certain arguments and they start worrying about assessing blame, and there is a little demagoguery, but in the end, something this important, they’ll do the right thing. So this really is an economic Pearl Harbor. That sounds melodramatic, but I’ve never used that phrase before. And this really is one. Go through why that is true beyond the fact that there is a freeze on credit, beyond the fact that nobody is making loans, beyond the fact that banks don’t lend to backs beyond the fact that treasury bills are at a low. Yeah. When 40 billion of treasury bills are sold like they were last week, seven day treasury bills, at a yield of 1/20th of one percent, that means the whole country is basically at the point virtually, or a lot of the country is at the point of putting the money under the mattress. One twentieth of one percent away from where it’s betting to put it under the mattress. You don’t want 300 million Americans putting their money under the mattress. This economy doesn’t work well without the lubrication of credit and trust. And that’s been lost. It’s a huge problem. What you have is you have the major institutions of the world all wanting to deleverage. They want to take down their assets and liabilities. What seemed so easy to borrow against a year ago now looks like rat poison to them. So they’re trying to deleverage. There is only one institution in the world that can leverage up in a way that’s all a countervailing force to that, and that’s the United States Treasury. Are you approving of what has been taking place along the stages that got us to where we are now, whether it’s Bear Stearns or Lehman Brothers or AIG, Freddie Mac and Fannie, or what you’ve done with Goldman Sachs and the rest? And asking for the power he is asking for and the level that he was asking for. No, they wouldn’t have gotten it. So I think it’s been, you know, kind of like a tragic play to this point. But at this point, I think it’s clear, and will be clear to the majority of the Congress. I think it’s clear to the American people that there is only one countervailing force to a world where financial institutions are trying to sell instruments every day and where credit has dried up, and that’s the United States Treasury. But at the same time, there has been, and Congressmen and women will tell you this, a resistance across the country because they think, as you well know, it’s a bailout of Wall Street and that they are sitting there in their own economic life, and nobody’s coming along to say, We’re here to help you. We’re from the government. Yeah. I think they probably don’t. And I think any time you couple the term “Wall Street” with “bailout” or something like that, you know — I don’t like what’s going on in Wall Street. I don’t like what’s going on with the executive compensation. You know, but I don’t want to give a lecture to this body that’s out there. You know, I mean, having had the heart attack, I want to get it back functioning. And as a practical matter, I mean if you were Bear Stearns, and you were a shareholder, you know, you lost 90 to 95 percent of your money. A good many lost their jobs. They lost very cushy lives, many of them. If you were at Lehman, the same thing happened. If you were at AIG, the shareholders are getting creamed on these things. And those shareholders are not just a bunch of big shots in Wall Street. Those are pension funds, and those are investors all over the country. I wouldn’t worry too much about that. Justice won’t be perfect on it. I mean, you may be very mad at some guy that walked away with a huge golden parachute, but that really isn’t the important thing. I mean, if Pearl Harbor came along, you could have said the planning was wrong by the military ahead of time or maybe the battleships shouldn’t have all been in the harbor and all that kind of thing. It doesn’t make any difference. I mean, the job is Pearl Harbor. And you better not spends weeks and weeks and weeks trying to assign blame or deciding on a complete plan for fighting the whole war, you know, and letting a committee decide where the battleships should go and all of that. You better spring into action with the best people you have. You have never seen anything like this in your life. There are those who argue that we are headed for a recession, you know? And they look at depression as the great fear. Is that a possibility if this plan doesn’t work? Yeah, it’s a possibility, yeah. We have about 6.1 percent unemployment now. I mean, we’ve been in a recession, by any common sense definition, because if you look at the American public, they’ve got 20 billion — 20 trillion, I should say, worth of residential homes. They’ve got 20 trillion worth of stocks, very roughly. Those are the two big assets of American families. They are both down dramatically for different families. But 95 percent of the people at least are worse off in terms of their residential wealth plus stock wealth from a year ago or two years ago. That is bleeding into the real economy. I mean, that’s bleeding into auto sales and jewelry sales and furniture sales and all that. But that wave is just starting to hit. And if the paralysis we have in the credit markets, if every company continues to feel all we want to do is get our balance sheet down, sell assets, you know, it’s just the start of what can happen. Unemployment’s going to go up under any circumstances. I mean, it’s the 6.1 is going to go higher. But whether it goes and quits at 7 or whether it quits as 10 or 11 or 12 depends on, among other things, the wisdom of Congress, and then the wisdom of, in terms of carrying out the plan that Congress authorizes. Would you say that this plan which you have argued very strongly the Senate ought to pass and the House ought to pass is simply the plan that we have, and I don’t have a better idea. But it’s essential for the confidence of the nation and the system? Every day that goes by, I mean, if you don’t react to Pearl Harbor for a week or two weeks or three weeks, you’re behind in the war that you otherwise would have fought. But it’s very important that the determination of the US Congress to do what is is needed be made evident this week and by the actions of most of the members. I mean, you’re not going to get total assent. Well, I think you’ve got — I don’t think you can have a better secretary of the Treasury than Hank Paulson, you know. I mean, he is in there at the wrong time, probably shouldn’t have taken the job. He’s a friend of mine. But he knows markets, he knows corporations’ work, he knows money, and he’s got the interests of the country at heart. And so, you’ve got the right — you’ve got a wonderful person with Sheila Bair, most of the viewers have never heard of Sheila Bair. Sheila Bair, in the last two weeks, has taken eight percent of the deposits in the United States and seamlessly moved those over to sound institutions which in turn have gotten more capital, ended up, it’s been a magnificent job. Eight percent of the deposits in the United States, 10s of millions of depositors. And nobody’s ever heard of her. She’ll never get a golden parachute or any severance pay or anything. She’s done a great job. We’ve got some great public servants. We have I think the right people in there to get the job done, and then they need more tools. And those more tools might be in addition to what’s in this plan? Well, they need plenty of money and they really need plenty of flexibility to carry out this plan. They also need in my view to very much tie it to market prices. I have said, Charlie, that the 700 billion, if they buy mortgage-related securities or mortgages themselves at current market prices, they’re going to make money over time because the United States government has staying power and it has a low cost of borrowing. And if I could take one percent of that 700 billion pot and take the gain or loss from it and be their partner, and they would buy the stuff at market, I’d make a lot of money. It’s — I mean you have hedge funds and people like that buying these assets to yield 15 or 20 percent, I mean, that’s the buyer for these people that are trying to unload them. The U.S. Treasury has got borrowing costs like nobody else has. They can borrow basically unlimited amounts. They can stay there for years and years. These assets will be worth more money over time. So when Merrill Lynch sells a bunch of mortgage-related assets at 22 cents on the dollar like they did a month or so ago, the buyer goes — is going to make money, and he’s going to make a lot more money if it happens to be an institution like the U.S. government which has very, very cheap borrowing costs. So you are saying to those taxpayers who are worried about what’s going to happen to the $700 billion, chances are good that when these securities are purchased and sold, you’ll get a lot of your money back. Or all of your money back, and maybe something else [spelled phonetically]. I would bet on it. I mean, if I got a chance to take one percent of the deal either way, I would make that bet. When Berkshire Hathaway laid out three billion dollars for GE today, we didn’t spend it, we invested it. When the Federal government buys the mortgages, they’re not spending it, they’re investing it. Now, they’re investing it in distress type assets but they’re buying them at distress prices if they buy them at market. It’s the kind of stuff I love to do. I just don’t have 700 million. Maybe we could go in it together. You know, with your money and my brains, I mean, there’s no telling how far we’d go. Whatever, I’ll take the deal, whatever you want to do. There is this, though, I mean, in terms of alternatives, some people have suggested for example that why don’t we — why isn’t America doing what Berkshire Hathaway is doing? Why isn’t that a better deal for America? I don’t think it would be crazy to have a model or an entity model on the Reconstruction Finance Corp. That goes back to 1932, although it was really implemented in ’33 under Jesse Jones, and it invested in mostly banks initially and preferred stock and that sort of thing. So there are two things needed in the system, the one that’s needed overwhelmingly is liquidity. I mean, when people are trying to [unintelligible], there has to be somebody there to buy. And they don’t have to buy at a fancy prices, but to buy. And then there’s also a capital problem with some of the institutions. We have provided capital here with a couple of institutions recently. The Federal government did that in the ’30s for the RFC and I think there could well be a proper role for government in that. Would that have been a better idea today? It wouldn’t have been big enough today. And it wouldn’t have been — you couldn’t have — if you’d set up at RFC today and you gave them $100 billion invested in the [spelled phonetically] capital, there’d be a very cumbersome type of application process and everything, these assets are getting shoved out day by day, and loans are coming to a commercial papers not being renewed. I mean, the commercial paper market, when that dries up, you know, that’s just like sucking the blood out of the economic body of the United States. And that’s happening. So I would say that an RFC-like thing might make sense. I probably would do it myself. But I don’t think trying to combine that with what’s going through now, I think what is needed now is liquidity. All right. There are those who — you just said you would do it yourself — there are those who believe and it has been suggested, you know, that this is the time for Warren Buffett to answer the call of his government in a country that’s been very good to him. I mean what are you prepared to do yourself beyond run Berkshire Hathaway well is this. Well, it’s the deleveraging that’s going on right now that has caused the credit crisis. You have talked about derivatives. Derivatives are, in part, at the core of this problem, yes? I’m interested in this because people are asking, did people get away with murder here? Were there people who simply gained the system and took advantage and made huge amounts of profit, and we had accesses that inevitably led to where we are today? Well, we had all of that. But I would say the biggest single cause was we had an incredible residential real estate bubble. I mean you can go back to tulip bulbs in Holland 400 years ago. The human beings going through combinations of fear and greed and all of that sort of thing, their behavior can lead to bubbles. And it may have had and Internet bubble at one time, you’ve had a farm bubble, farmland bubble in the Midwest which resulted in all kinds of tragedy in the early ’80s. But 300 million Americans, their lending institutions, their government, their media, all believed that house prices were going to go up consistently. And that got billed into a $20 trillion residential home market. Lending was done based on it, and everybody did a lot of foolish things. And people really behaved in a fraudulent way or something, we’ll go back and find the culprits later on. But that really isn’t the problem we have. I mean that’s where it came from, though. We leveraged up and if you have a 20 percent fall in value of a $20 trillion asset, that’s $4 trillion. And when $4 trillion lands — losses land in the wrong part of this economy, it can gum up the whole place. And it continues with respect to the housing market. And some will argue that we have to do something about that in terms of a long-term recovery of the American economy. Well, there is no question we have an access stock. The good thing is, we have household formation in this country. We have a country where I don’t know whether it’s a million households a year or more, but good form. So we can eat off an [unintelligible], but too big, and house prices just soared beyond — beyond reason in many places and they got financed in silly ways, and people lied about loans, all kinds of accesses entered into it. But that is what — that is the single biggest cause of why we’re here. And should wise people have known better? People should always know better. I mean people — people don’t get — they don’t get smarter about things that get as basic as greed and you can’t stand to see your neighbor getting rich. You know you’re smarter than he is, and he’s doing these things, you know, and he’s getting rich, and your spouse is getting unhappy with you because you aren’t doing — pretty soon you start doing it. And so you get what I call the natural progression, the three Is. The innovators, the imitators, and the idiots. And that’s what happens. Everybody just kind of goes along. And you look kind of silly if you disagree. I mean, you know, you could have these crazy Internet valuations in the late 1990s, but they prove themselves out in the market. The next day they were selling for more than they were the day before, and people said, you know, you’re crazy if you don’t get in on this. So it’s very human. Now, with housing it’s something even more dramatic than that, because most people aspire to own their own home. And if you really think that houses prices are going to go up next year and the year after, you feel if I don’t buy it this year, I’m going to have to buy it next year. That’s not true of an Internet stock. But it’s true of a home. And when somebody makes it very easy for you to do it by saying you don’t really have to put up my money, you can lie about your income a little, or we’ll give you 100 percent mortgage, you’re going to do it, because everybody that’s done it has been proven right. You have what they call social tools, and, you know, you’re going to feel like an idiot if you didn’t do it, because the house cost more. And so when you look at where we are going, there seems to be two issues that are apparent to me at least, risk and leverage. We just lost sight of risk and leverage of what was appropriate? Yeah. Again, because it pays off for a while. You know, you can lose leverage, and it’s the only way a smart guy can go broke. If you owe money, you can’t pay them out. You just pay for everything, you do smart things, you eventually get very rich. If you do smart things and use leverage and do one wrong thing along the way, it could wipe you out, because anything times zero is zero. But it’s reinforcing when the people around you are doing it successfully, you’re doing it successfully, and it’s a lot like Cinderella at the ball. I mean you know at midnight everything is going to turn to pumpkins and mice; right? But if the evening goes along, I mean, you know, the guys look better all the time, the music sounds better, it’s more and more fun, you think why the hell should I leave at quarter of 12. I’ll leave at two minutes to 12. But the trouble is, there are no clocks on the wall. And everybody thinks they’re going to leave at two minutes to 12. And you’re having a good time. That’s what I hope gets done. It’s whether people think it’s too little, when you get all through with it. I mean in the end, 700 billion is a lot of money. And it will buy a lot of distressed property. And if you buy them at the right price, you may be buying two trillion of face value. The one thing you don’t want to do — [unintelligible] paid for it what you’re paying it from or what his carrying value is, you got to buy it at market. And one way to do that is if some institution wants to sell you a billion dollars worth of mortgages, they might have to sell 100 million in the market, and then you’ll buy the other 900 million on the same terms. Now, the very fact that this has been authorized or will be authorized, I hope, will firm up the market to some degree. And that’s fine. But you don’t want to have artificial prices being paid. What do you believe might never be the same? Oh, I think confidence will come back. I will tell you this. This country is going — be living better ten years from now than it is now. It will be living better in 20 years from now than ten years from now. The ingredients that made this country, you know, the miracle of the world — I mean we had a seven for one improvement in the average American standard of living in the 20th century. Now, we had the great depression, we had two world wars, we had the flu epidemic. You know, we had oil shock. You know, we had all these terrible things happen. But something about the American system unleashed more and of a potential to human beings over that hundred years so that we had a seven for one improvement in — there’s never been any — I mean, you have centuries where if you’ve got a 1 percent improvement, then it’s something. So we’ve got a great system. And we’ve got more productive capacity now than we ever have. The American worker is more productive than he’s ever been. We’ve got more people to do it. We’ve got all the ingredients for a sensational future. It’s just that right now the athlete’s on the floor. But we — this is a super athlete. And what’s the impact of the athlete being on the floor around the globe? Plenty. Plenty, and we’re finding that out. And the same things happen to quite an extent around the globe. I mean, the European banks were doing what the American banks were. And they’re failing now, too. Yeah. I mean, they were getting the mortgage of some guy in Omaha, you know, securitized a couple of times. I mean he had all these — they had all these types from Wall Street, you know, and they had advanced degrees, and they look very alert, and they came with these — they came with these things that said gamma and alpha and sigma and all that. And all I can say is beware of geeks, you know, bearing formulas. They’ve heard that in Europe. Have we learned something about decoupling or the American economy in terms of its impact, for example, China, a place where you’ve had investments, and you know well. Yeah. We just made a new one a couple days ago. In a company called BYD , and they develop a really good electric car, I hope. Is there an operative narrative to the kinds of investments you are making other than you look at and you buy on value, look at advantagement [spelled phonetically] you look at a place that can absorbed the amount of money you want to invest, and you look at its prospects, and you look at price. Prices make a lot more sense now, yeah. And I’m not worried they’re all about the investments we make. I mean, listen, this country — we’ve got $46,000 or $47,000 of GDP per capita. Now, we’ve done pretty darn well. We’ll do better in the future. I am not worried about the country. I’m just worried about anything that gums up the potential of the country. And right now, it’s pretty gummed up. Okay. But we do this emergency, urgent rescue. Come January, we have a new president. We have a new treasury secretary. We have a new legislature. What’s there in parity? What will be the challenge for them because they then can take a little bit of a longer term, look, maybe the patient’s getting up off the ground. And but you want to get him or her moving faster. Yeah. Well, I think it will get moving faster. I mean once you get it off the — once credit flows — now the recession is going to get worse. I mean, I don’t want to hold out false hopes that the — by some magic moment, that things will turn around in a couple months because they wouldn’t, Charlie. I mean, and it’s a big mistake to try and mislead people. They will turn around. I don’t know whether it will be six months or whether it’ll be two years. It’s more likely two years than six months. That’s sort of the best case, yeah. That’s sort of the best case. If we don’t do the things we should do, it could be five years, sure. Okay. We should do, though, beyond where we are now. What are those things? Well, I would say this, if it becomes evident that — I understand the latest bill, they’re talking about 350 billion early and then going back. But we need to throw the resources at this that are necessary. But like I say, we are not spending money. I mean, if we buy these assets intelligently, the United States Treasury will make money. I mean, it’s borrowing money. It’s just a few percent a year. And these assets are better than that. Okay. But that’s a very big if. And it makes a difference who the treasury secretary is. Okay. So that’s the important question in terms of whether we buy these assets wisely. I would say it’s more important who the treasury secretary is than who the vice president is. If you want to have a debate here, I’d like a debate between potential treasury secretaries than the vice presidential debate. Well, might it be a good thing for the presidential candidates to tell it who it is they’re going to be listening to and who might be a potential treasury secretary? Well, presidential candidates which I know listen to you. That’s because they tell you that, aren’t they? Well, no, but I mean it’s not their job to know the candidacy of people. When all these people call you up, what are they asking you? I mean, you’re hearing from your friends and people at the Fed, you’ve been through this before too I mean you were that long term capital , a lot of other times you have had to face difficult crisis. I’ve seen a lot of things happen. So they come to you and they say “You’ve fought wars before, Warren, we’d like to talk to you.” But what’s the question they’re asking? What is it they want to know? And I’m talking about smart people who are charged with fixing it. Yeah. Well, lately they’ve been asking will this work. A blank check, $700 billion, go spend it? Yeah, go invest it. Go invest it. And maybe put up a little of your own money up beside it, I mean, I might ask Hank to go invest with me. – go with oversight? I mean, that’s what [inaudible], go with oversight. But how do we determine whether it’s being done wisely? Yeah, I think you’ll have plenty of scrutiny as how the money’s invested. I mean, just like the RFC. When the RFC operated, people knew which institutions they were buying preferred stock in. And it worked very well. But is this different from the Resolution Trust Company because they are talking about securities, not real estate? Yeah, well Resolution Trust Company was set up to liquidate a bunch of assets that the government had inherited because the savings and loans went broke. So the savings and loans went broke, the government stepped in, paid off depositors, and now they’re left with this mass of assets to sell. We’re not talking about selling here, we’re talking about buying intelligently. They were selling what they got handed to them by a bunch of savings and loan operators that had in many cases had done some very dumb thing. But their job was to liquidate it. And they liquidated. This is an entirely different proposition. Markets aren’t — people do, as long as you have markets, you’ll have excesses. People went crazy with tulip bulbs. They went crazy with the South Sea Bubble, they went crazy internet stocks, they went crazy with the uranium stocks back when I was first getting started. I mean, you know, you’re not going to change the human animal. And the human animal really doesn’t get a lot smarter. Now, you can you know you can have institutions that put curbs on that in various ways, and actually what the banks, you know, they have various capital ratios and that sort of thing, but the banks got around them, I mean, they set up sieves and that sort of thing just to get more leverage. People love leverage when it’s working. I mean, it’s so easy to borrow money from a guy at X and put it out at X [inaudible]. Yeah, but you don’t get the X plus one back, if you still have the X on the other side you’re in trouble. There is this, too, accounting. You have strong feelings about accounting and mark [spelled phonetically] to market. Tell me where you are on that issue. A lot of people disagree with me on this, I believe in mark to market. I think that accounting in 1974 Charlie, it was either 1974 or ’75, we owned a bunch of common stocks at Berkshire Hathaway. I told our shareholders what the market was. And we used that. I said I think these things are worth a lot more than market. And I think we’re going to make a lot of money out of it. But this is what they’re worth today. And I don’t think anybody gets hurt by telling the truth on that sort of thing. And I think that once you start saying we’re going to peg these things at some price that isn’t market, God knows what a financial [talking simultaneously]. They’re not worth it today. – therefore we’re not seeing a reality. – on value. I mean, you can explain the fact that these are depressed prices, you know. We think these assets are going to be worth a lot more. And I think that case can be made in certain situations. But I think to just say, you know, we’re going to say a dollar of cash is worth $2 all of a sudden, it isn’t worth $2. It’s worth a dollar today. And I think once you start putting phony figures into financial statements, you get in a lot of trouble. And we’ve seen so much of that in the last 20 years. But what would you reform about that in terms of the way the accounting process — you’d keep mark to market? The rule [unintelligible]. I mean it’s — it’s a nightmare to administer some of this sort of thing, but I want to tell the shareholders of Berkshire, to the percent we own marketable securities or things for which there are market, even if those markets — I want to tell them what it’s all about. As a matter of fact, I’ve already written a section in the annual report for next year explaining why I think in one case that the figures on our balance sheet as calculated are wrong. But it’s the standard way of doing it. It’s holy writ. The SEC wants us to do it that way, and we’ll do it that way, and I’ll explain why I think it’s wrong and shareholders can read it and see whether they agree with my logic or don’t. You — when you look at the prospects for this country, there are other people who argue, you know, that America, as good as it is, lives in a world today and there are books being written in which our supremacy, our primacy will now have to be shared. That we may still own as much of the pie as we had, but other people will own a lot more. That’s great. You know, I want our — I want our pie to grow all the people, but if some other guy’s pie is growing a little faster, that’s terrific. It will be good for us in the long run, and I mean there are, you know, six and a half billion people in this world. And it’s great for 300 million to keep enjoying more and more property, but I think it’s terrific if, you know, the remainder do. And I think if they can learn something from us in terms of our system, and I think they have, they are learning more about how to unleash the potential of their citizenry to turn out more goods and services that their citizens want or that we want, I think that’s terrific. And that’s — you know, I think it’s much better to live in the world where those around you, particularly when some of them have nuclear bombs, I think it’s much better to live in a world where their lives are getting better also. Yeah. But you mean you look at that. So when you look at China today, and you look at some Asian countries and the amount of American debt they have, how much does that concern you in today’s economic circumstances? And are they losing some of their confidence in America? And does that pose a huge problem for us? Well, somebody’s buying these treasury bills at 1/20th of one percent. I mean the — we — [talking simultaneously] consuming about $2 billion a day of goods and services beyond what we’re producing. In other words, the rest of the world sends about $2 billion a day net of something. We got to send them something in return, don’t we. So we send them little pieces of paper. That would be nice if they stuck them all under a mattress, but they got to buy something with them. Sometimes they buy a treasury note, sometimes they set up sovereign wealth funds. They can do all kinds of things. They can buy our companies here. As long as we consume more than we produce, and we trade away little pieces of the country daily, they’re going to own something. Now, they can’t run from American assets. I mean every day the rest of the world is going to have about two billion more of American assets than we have, as long as they sell us these goods. Yeah, and they want to sell us these goods. But you don’t believe that’s good. I mean you believe that an increasing current accounts deficit is bad. And it reflects American’s consumption ideas rather than its savings ideas. But how does that change? Well, I laid out — it’s kind of a Rube Goldberg plan a few years ago, which I don’t like myself, except I like it better than the alternative, which is what we’re doing. But we’ve actually been pretty good on exports. I mean we are exporting 12% of our GDP now roughly. That was five percent many years ago, a much smaller GDP. So the rest of the world really likes our stuff pretty well. It’s just we buy so damn much of what they produce. And I think — I think that should be something addressed by — I don’t think it’s the most pressing problem now at all. We are trading away a little bit of our country all the time for this access consumption that we have over what we’ve produced. That is not good. I think it’s terrible over time. But our country’s productive grows enough so we actually can do that, and we’ll still be better off. We just don’t be as well off as if we hadn’t done it. What’s all this going to do to the price of the dollar? It could be very tough on — inflation could be a very — is a likely consequence out of what’s going on now. Right now, we are in effect making a — to some extent, making a choice between future inflation and getting our — getting off the floor. And we’re likely — we’re likely to have more inflation in the future as a consequence of the things we do to fight the present situation. Senator Obama, who you support, I think, I don’t want — to be clear on this, but made an economic speech today, talks about another stimulus program. Is that essential at this time? I think the biggest thing we need now is to unclog the credit markets, and we may need another stimulus — if we do, it’s — it should go to the lower and middle-income people. I mean the truth is, I’ve never had it so good in terms of taxes. I am paying the lowest tax rate that I’ve ever paid in my life. Now, that’s crazy. And if you look at the Forbes 400, they are paying a lower rate, accounting payroll taxes, than their secretary or — whomever around their office. On average. And so I think that actually people in my situation should be paying more tax. I think the rest of the country should be paying less, the 95 percent that Obama talks about or maybe even a little higher than that. But I think that a stimulus plan should really be geared to the people. You know, you’ve got — you’ve got, what, 24 million households, 1/5th of the households of the United States, you have earning $21,000 a year or less, on average of close to four people, three people in those households. Two and a half they will actually probably. But just imagine living on 21,000 a year, Charlie, 22,000 a year. I mean you have 20 percent of the population doing that. So you don’t have to worry about guys like me. I would push purchasing power — you push out $1,000 of purchasing to those people, it’s going to get — it’s going to get spent. And it needs to be spent. They need it. And it should come, to some extent, from guys like me. … what about the capital gains tax? Well, you know, the capital gains tax is 15 percent now. So I sit there in my office and I make a lot of money by capital gains, and I pay 15 percent, and I pay no payroll tax on it. The woman that comes in, takes the wastebasket away, she’s paying 15.3 or whatever it is on payroll tax alone. I mean it is — I never had it so good. So therefore the capital gains tax should be changed to 18, 25, 30? I think it’s terrible for people in effect to say that income from investment should be taxed at a much lower rate than income from labor. I mean I just think that you’re going to — we’re going to spend 3.1 trillion, something like that, this year. We’re going to only raise about 2.6 trillion or something like — you’re going to raise it from somebody. You know. Now, who you’re going to get it from, you’re going to get it from me and you, or you’re going to get it from, you know, the people that drive the taxis, bring me here. Whatever. Maybe. I mean you got to get it from somebody. And, you know, everybody is against paying tax. I feel the same, everybody feels that way. But if you want a government that’s going to do the things we ask our government to do, you’ve got to get it from somebody. And over the years, the last — particularly the last six or eight years, they’ve taken less and less from a guy like me. Now, you know, everybody likes to talk about how the top one percent pays this percent in income, but the income tax, we’ll say 1.3 trillion. The payroll taxes are over 900 billion. That 900 billion, that doesn’t come from me. I pay it on the first hundred thousand or something like that. But that comes from the people in my office. And they are paying 900 billion — nobody ever talked about that when they talk about what the one percent is paying. I love to tell how I’m suffering because one percent we’re paying 25 percent of the total. We’re not paying 25 percent of the total taxes on individuals. We’re paying maybe 25 percent of the income tax, but the payroll tax is over a third of the receipts of the federal government. And they don’t take that from me on capital gains. They don’t take that from me on dividends. They take from the woman who comes in and takes the wastebaskets out. You mentioned inflation. The possibilities of inflation. Are you therefore — do you have a position on what interest rates — what the fed should do about interest rates? Well, I think that’s almost — for the time being, just put that aside and we’ll get to that after the patient is up and walking. It’s interesting, though. I mean we are — what’s going to happen — things we’re doing are going to have some inflationary consequences. But, you see, interest rates, you know, very low levels, including the long rates. When we watch this, I mean you and I are having this conversation today. The senate votes tonight. House may vote. People I talked to today believe it’s going to pass. Whatever happened to change minds either in the combination of what they did with the plan and tweaking the plan, or B, some people got so scared by the failure of the vote last time that it brought home a danger of not doing anything. All right. How will we measure the progress, whether this is working or not? What’s the indicia? – leadership that can explain what it’s all about? When the president of the United States goes out at, you know, 8:00 o’clock in the morning and then his own party votes gets him 2 to 1 in the house, you know that somehow a message isn’t getting out. It takes real leadership. I mean Roosevelt didn’t — you know, when he came in, he didn’t print any money. Well, he actually may have done [unintelligible], but he — it wasn’t like, you know, you’ve got the greatest economics professor in the world or anything else. But he did restore confidence. And they did a lot of thing. And you needed it. You needed to jump-start the economy. It took a long time. I mean, the world did not change, you know, in 1933 or ’4. But we put in things like the FDIC. I think the FDIC was one of the great inventions of the American [unintelligible]. Well, they had to tweak that in terms of his bill, did they not? They’re going the right direction, yeah. Roosevelt also said the only thing we have to fear is fear itself, which is clearly the fear that exists in the country. Tell me when you worried the most of all the things that you have seen over the last three weeks, say. I mean how about in the last month, when did you say, my God, I never knew it could get to this point? Well, I don’t get that afraid in a sense because I really do have faith in both — I know the country works extremely well. You know, but when it isn’t clogged up. And I know that Congress will do the right thing. But I will tell you, when I watched the House vote the other day, I wasn’t afraid because I — I still felt something would pass. But I — we are going through a very, very tough period. And, you know, I did not think I would see the day when, you know, an AIG would not be able to have its checks clear. Everybody would have been exposed, Charlie. Everybody. So why was there even a question of not rescuing AIG at that time? Well, I think what people understand there probably — well, they were hoping the private sector would do it. I mean, that’s the same way I would behave. If I were the treasury secretary or head of the Fed, you know, I would try to scare the hell the out of the private sector and say, you better save this because you’re going down with the ship. So you guys save it. And I went as long as I could worrying if they didn’t save it, I’d come in. Well, did that in fact happen during this crisis in which the secretary of the treasury said you better save this or we’ll all going down? You better put up some cash right now. I think that they hoped the private sector would come in. And the private sector tried to come in until they saw the size of the problem. I mean, from were people on that weekend that thought they’d had a solution. And then the hole kept getting bigger and bigger. And all of a sudden became apparent that 20 billion wouldn’t do it and 30 billion wouldn’t do it and 40 billion wouldn’t do it. So it got beyond anybody’s ability to certainly to do it in a short period of time. There was not enough capital available other than from the government. It’s an unknown situation. You have the derivative book, [unintelligible] AIG financial products, you know. Nobody’s every heard of it except it was a terrific profit center. You know, you could manufacturer earnings out of it, do all these things. And I will guarantee that you the top management — and I’m not knocking them for this. I don’t think I could have done it. They couldn’t get their minds around it. I bought a company called General Reinsurance in 1998 that had a similar but much smaller operation, had 23,000 contracts in it. And you had to get rid of it. I got to get out of this. It cost me 400-and-some million dollars in benign — in a benign situation. But when this was not a benign situation. If AIG had tried to unwind their derivatives books. I don’t know. It would have hit every institution in the world. And there was no private capital to come in and do that. No. Not even Berkshire Hathaway. I mean, if I thought 5 or 10 billion would have bought me a good deal, and I could have done that, I’d have done it. But 85 billion might not have been. – where they are very likely to get their money back; maybe more. They participate 80 percent — I mean, they drove tough terms. I mean I want to hire the guy that made that deal. He’d fit in well at Berkshire. A lot of people look at you and Goldman Sachs and GE saying I want to hire the guy that made that deal for you. No, Tim Geithner did a better job on this one. So we come down to the close of this conversation and you have been warning us about certain kinds of things. I hear from this conversation too this plan is essential now. Otherwise we’re in a very, very difficult place and each week we go beyond not doing something we get deeper and it becomes more irreversible. You’re going to see people unemployed. It really is. And you can’t help some increase from this point. I don’t want any viewer to go away think a magic wand exists in Congress. So they’re going to see some more bad news. But if we do this, we’re doing the right thing. And if — the system will work over time. There’s no — we got a wonderful system. Okay, but I mean let me come to that in the end. Do we need to do anything about the system? And beyond the emergency of the moment, the urgency of the moment, come January, about the system, lots of talk about regulation as you know and finding the right balance, lots of talk about whether government involvement is an idea we need more of rather than less of, rethinking sort of what President Reagan brought to fore. Once we get the [unintelligible] back, we can [unintelligible] changes [unintelligible], exercising [unintelligible], we can do all of that sort of thing. And you know if I got any good ideas out of that or I think they’re good ideas, I’ll be glad to contribute them but the system will probably overdo some other things. I mean, the nature of democracy is such that when there’s this — there’ll be this revulsion, obviously, toward — that’s never going to happen again, so we’ll probably attack it in various ways that don’t make sense. But I — that’s what Congress is for. And that’s what advisors are for. And I’m all for getting the best minds you can get to work on that kind of thing. Like I say, I don’t think it’ll be done perfectly. Maybe we’ll end up with a little bit better system. But the end, we had a pretty good system over time. But when we went crazy, and we did go crazy on residential real estate, it set things in motion that just — the dominoes started toppling. Warren Buffett. We’re in San Diego. My thanks to the people at KPBS here. A conversation here about the crisis that we all face, and hearing from a man that a lot of people want to hear from. And I’m pleased that we were able to join with him here. Thank you for joining us. See you next time.